Grey isn’t going anywhere! A long-time favourite of interior designers and home-owners alike, grey’s magical ability to be neutral yet elegant and sophisticated means it’s a trend that’s here to stay. Dark grey shades are deep and decadent, whilst retaining a neutral characteristic that will sit comfortably with pretty much any other colour. You’ll find dark grey velvets, cottons and tweeds, including many that are Family Friendly - bonus! A dark grey sofa is warm and inviting. Get the look of this stylish Scandinavian apartment by setting your velvet sofa against a dark grey wall and textured rug. Warmth and colour is introduced in the form of gorgeous retro-style tan leather. If you prefer the middle ground, then a mid-grey could just be your colour. 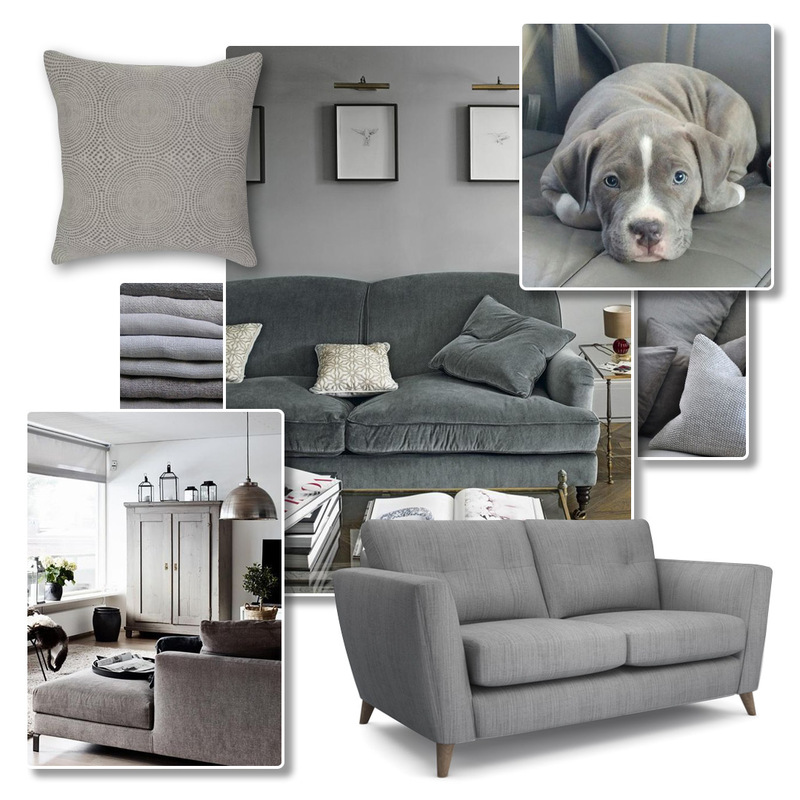 A statement shade that’s easy to maintain, mid-grey is a timeless choice for your lounge. We love the industrially-inspired look of this modern grey sofa set against painted brick walls. Get the look by accessorising your mid-grey sofa with darker grey shades and hints of moss green. Pale greys are the epitome of elegance. You’ll find that our collection of light greys features velvet, chenille, linen and even gorgeously soft leather. If the idea of a pale grey sofa scares you, fear not! 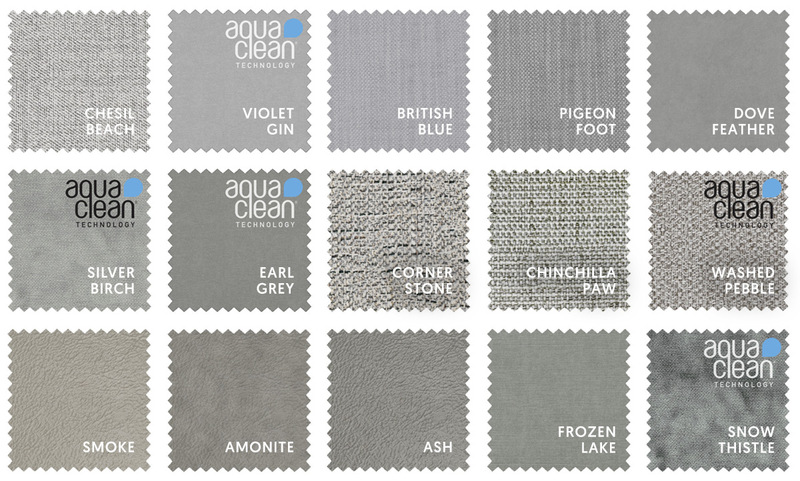 Simply choose a fabric that displays the Aquaclean logo, and you’ll have a sofa that’s wipe clean; simply remove everyday stains with a damp cloth. Find out more about our innovative Family Friendly Fabrics. If you love the soft, Scandi-inspired look of this pale grey sofa, you can recreate it by cladding a contemporary sofa shape with one of our light grey fabrics. Keep the accessories simple and add a splash of blush pink to lift the look. Love grey, but not sure where to start? We’d recommend choosing up to 8 FREE fabric samples and getting them delivered to your home. Whether your preferred sofa is classic or contemporary, grey will make it look stylish and timeless. If you want some grey inspiration, head to Pinterest and explore our ‘Gorgeous Greys’ pinboard.